With three events planned across the Midwest this fall, Consumer Electronics Distributors welcomes dealers to join them for demos, prizes, deals and fun. 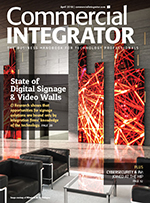 Consumer Electronics Distributors, a member of the PowerHouse Alliance and regional distributor of consumer and specialty electronics for the Chicago metropolitan market and broader midwest U.S., recently announced three Fall Ball Technology Summits for dealers and industry partners in late September and early October. The Fall Ball series will start Sept. 26 from 10 a.m. to 6:30 p.m. at Pinstripes in Oak Brook, Ill. 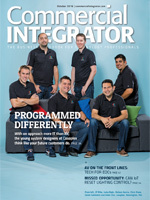 Dealers, vendors and industry partners will have the chance to mingle while bowling and playing bocce. 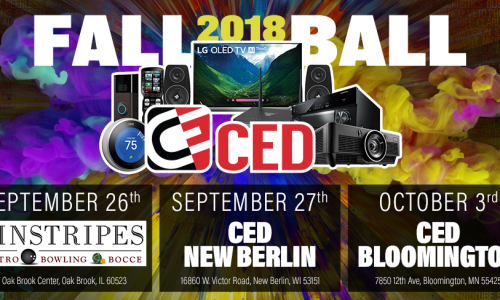 The Fall Ball will continue at C.E.D.’s New Berlin, Wisc., location and Bloomington, Minn., location from 9 a.m. to 7 p.m. on Sept. 27 and Oct. 3, respectively. “Our Fall Ball series is the perfect opportunity for dealers to get a look under the hood at all the new products for the Q4 buying season,” said C.E.D. VP Mike Baginski. Those who take part in any of the events will benefit from a day of great food, exclusive deals, hundreds of prizes as well as new product demos and a chance to meet with reps from more than 30 manufacturers, including eero, iPort, Jamo, JVC, LG, Lutron, Luxul, Peerless-AV, Polk Audio, Samsung, Sanus, SoundTube, URC, Vanco International, WyreStorm, and Yamaha. Those who attend the New Berlin, Wisc., event can also chat with the Sonos team and test out the latest in wireless audio products. LG and Samsung will also be running training sessions at all three events for interested dealers. “Now in its 26th year, the C.E.D. 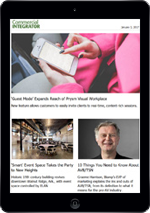 team decided to shake things up for the 2018 Fall Ball and move the first stop to an offsite location,” said Consumer Electronics Distributors president Avery Baron. Click here to register for any of the three 2018 Consumer Electronics Distributors Fall Ball events.